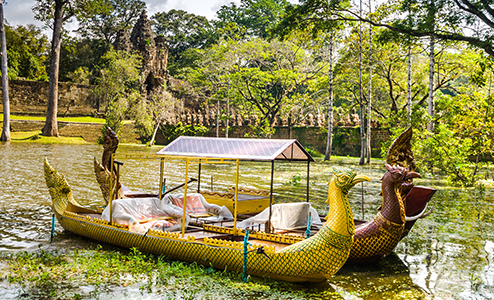 Board a luxury vintage train or meander on a river cruise to truly experience the surroundings as a local might, with time to admire the journey and not just the destination. 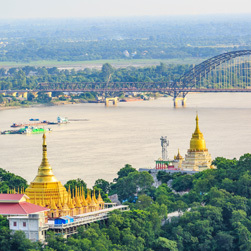 Cruise in luxury on the Anawrahta vessel traversing the beautiful yet seldom-visited Chindwin River, the largest tributary of the Ayeyarwady. 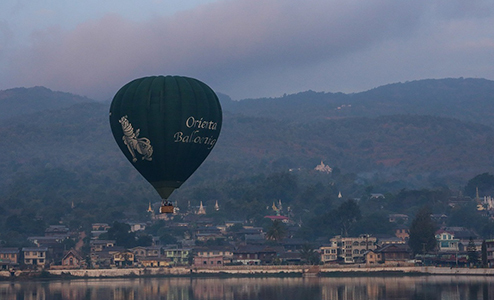 Boating on Inle Lake is an incredible experience, but nothing quite compares to flying over Myanmar’s second largest lake in a hot air balloon. 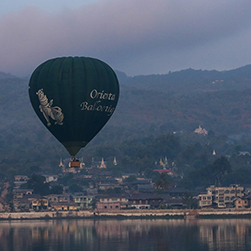 Enjoy hot drinks and a continental breakfast while watching your balloon being inflated in the early dawn hours. After a full safety briefing from experienced, UK-licensed commercial balloon pilots, begin your 45-60 minute flight, with the possibility of rising up to 3,000m (10,000ft) thanks to being in a sparsely populated area with the nearest airport two mountain ranges away and with no early morning flights. 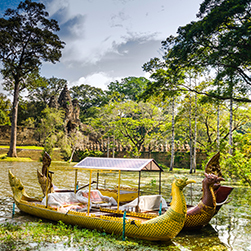 Enjoy the magnificent views over the colourful clapboard houses, the beautiful lines of floating gardens and the surrounding Shan mountains in this once-in-a-lifetime experience. 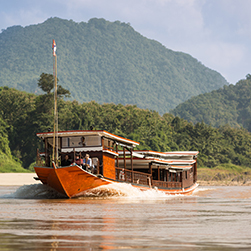 The saying that “it’s not about the destination; it’s about the journey” could very well apply to travelling along the mighty Mekong River from Huay Xai (just across the river from Chiang Khong in Thailand) to Luang Prabang. 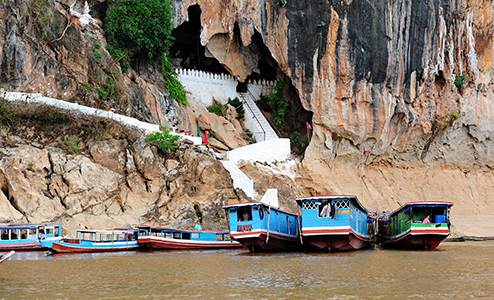 An excellent option for those travelling overland from Thailand (including Chiang Mai and Chiang Rai) into Laos, this comfortable two-day, one-night cruise makes several interesting stops along the way visiting two ethnic minority villages including the lowland Lao village of Ban Baw, famed for its Lao whisky and woven handicrafts, and the Pak Ou Caves, home to thousands of Buddha statues. 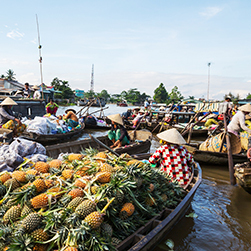 On the boat, sit back, relax and watch the ever-changing riverscapes go by, highlighted by verdant forests, banana and coconut plantations and more. 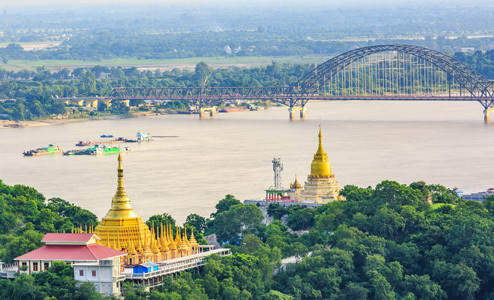 The Mekong River touches the lives of millions as it flows some 4,500km (2,702mi), with at least one-third forming the international border between Laos and Thailand. 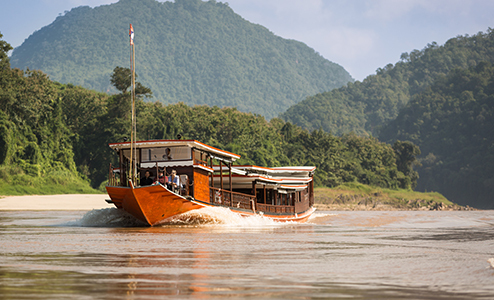 Get to know the Mekong up close and personal as it flows through northern Laos on a two-day, one-night river cruise between Luang Prabang and Pakbeng, halfway to the Thai border. 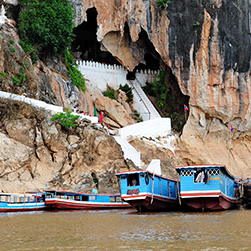 Shore excursions include visiting a hill tribe village famed for producing lao-lao, a traditional whisky made from fermented rice, and the mysterious Pak Ou Caves, home to some 4,000 Buddha statues left over the centuries by devoted worshippers. 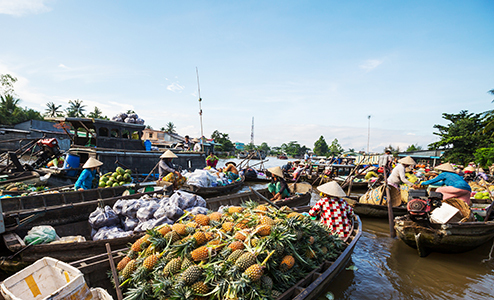 In between stops, take in the natural beauty of the river in this particularly scenic stretch of the Mekong.